Anyone should be able to build SharePoint Add-Ins. Much of SharePoint’s popularity has stemmed from its flexibility. A single farm (or online tenancy) can deliver corporate intranets, document collaboration workspaces, business intelligence dashboards, shared tasks and calendars, company-wide search solutions, records management vaults, and custom solutions that combine lists, forms, and other application logic. It's that last part that matters; SharePoint wants you to extend it. One can create entire solutions that live inside SharePoint sites, consisting of pages, lists, content types, column definitions, forms, connections to external data, application logic, and other assets. But those custom solutions won’t scale unless they can be package and staged for reuse. You can solve one problem in one site for yourself, but if another group/department/division wants to do the same thing, they must carefully recreate it by hand – unless you can package your solution as an Add-In. SharePoint Add-Ins are applications that you select from a catalogue and add to your sites. They can be staged in a private corporate catalogue or published and sold on the AppSource marketplace for any user to install. They’re varied; they can contain tools like a designer to make dynamic SharePoint Forms, integrated access to third-party software, automated workflows, code and/or settings to customise the look and feel of a site, or new tools for things like viewing content aggregated across a widespread set of lists and libraries. Add-Ins take SharePoint beyond a place where work is put to a place where work is done. The problem is that Add-Ins aren’t easy to build. You need professional development skills to create them. Will the Add-In be SharePoint-hosted or Provider-hosted? Which API should you use for the accessing of SharePoint data? Should you use one of the Client object models, REST endpoints, the SharePoint framework, etc.? Will you distribute your Add-In to your organization’s add-in catalogue or to AppSource? Are you proficient with Visual Studio when it comes to application development? How will you avoid hard-code references or other assumptions that would make your add-in break when it’s added to a different site? The same is true for managing Add-Ins once they have been published. Managing SharePoint Add-Ins throughout their lifecycle—fixing bugs and updating functionality when necessary—is a time-consuming process. It’s equally true for knowing which add-ins are in use, where, and by whom. skybow Solution Studio exists to make designing, deploying, packaging, and even selling an entire solution something within reach of non-coders. These could be professionals who’d like to get more done in less time, but it could also be “citizen developers”, people for whom building apps is a secondary activity to their ”real” jobs and have an intimate understanding of the business problem even if their technical skills have some limits. We’ve offered (and continue to offer) a form designer, a theme builder, and other a la carte tools for some time now, and customers have done great work with them. But those were one-time/one-place deliverables. An integrated design environment for creating lists, forms, pages… all of the assets need to deliver a solution hosted in a SharePoint site. A set of ready-to-use services and components that can be used within a solution. The ability to package the designed solution for distribution in a variety of ways, including as a SharePoint add-in. With skybow, you can create solutions for SharePoint Server and SharePoint Online in Office 365 with ease, requiring little to no code at all. skybow makes creating solutions fast and easy without sacrificing quality or security, helping businesses reduce development costs by up to 85% and decrease time-to-market of new solutions by up to 50% (compared to traditional development approaches). While a no-code approach makes SharePoint Add-In development more approachable, if this is your first time building apps, you might still be unsure where to start. skybow’s solution templates are the perfect bridge to your first Add-In, letting you customize your solution from there. And you can always get in touch with our expert team to guide you through any stage of the process. Everyone with a good idea should be able to build SharePoint Add-Ins to get more done, and to leverage their existing SharePoint investment to host them. And with skybow, everyone with a good idea can indeed do just that. 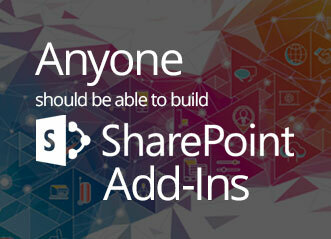 For more information on building SharePoint Add-Ins to take your business further, get in touch with us today.